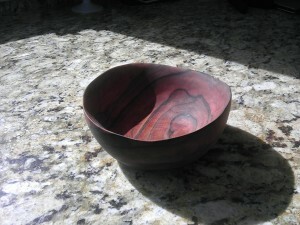 Sticking with free form bowls for a moment, I had a piece of tineo lying around. It’s not endangered. It’s a South American evergreen. Very beautiful though. The last bowl showed me that an angle grinder might be a fine way to make irregular concave things. All one needs sometimes is an idea. Indeed, ideas can be deadly. 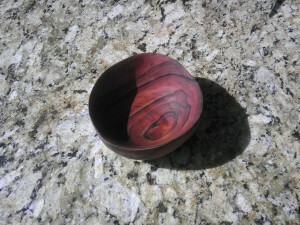 But here the consequence was merely a bowl, so not too much to fret about. 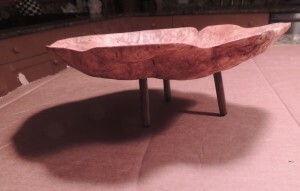 I’ve thought I might make a personal use sized spoon to go with it and self-indulge a little neo-primitive and eat with those things for a while, but an idea like that is right on the line of how far I will go to chase an erstwhile good idea. Them ideas again. There’s idiosyncratic, there iconoclastic, but such would not be that far, there’s idiopathic, which is really a fabulous characterization but does not pertain – though it might – there’s probably even ideopathological considerations, but thankfully this is just a bowl. It tempts me to want to associate it with other thoughts, but maybe that’s the lure of objects, that temptation to connect them to meanings we’d like them to have. Otherwise it has been a very long winter here. Many half-complete projects await progress. With a little imagination, for example making yourself tiny, tinier than this, and looking up at it, could it not vaguely be like the vessel in which the war of the worlds creatures arrived in on that surprising day in New Jersey so long ago? I mean really. 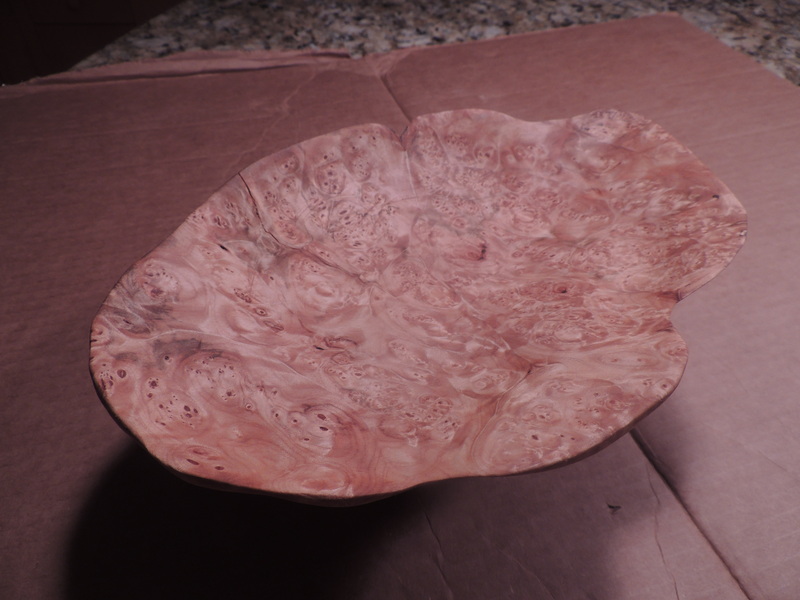 This is a freehand bowl of maple burl replete with many eyes. Another feature a strangely organic alien space vessel would be replete with. An angle grinder was the enabling tool. In the previous box 12, that box of so many unrelated themes, I had learned how fabulous a tool such could be for raw free form shaping. 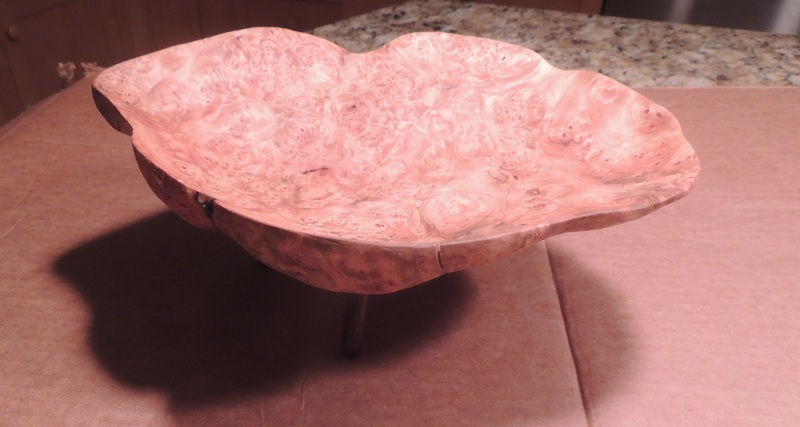 I had this burl sitting around. (This is the cover story, if you can’t tell). I learned a lot about finishing. 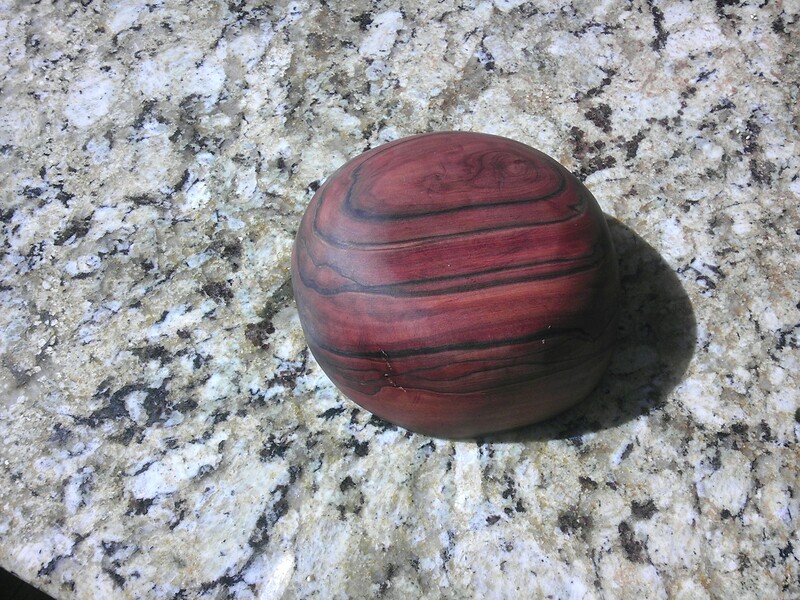 I sanded till I had blisters. It’s not a very useful bowl, being shallow and perched on three skinny walnut legs. The wood itself is cool – this is another very pixelful image, clicking on it twice will reveal a universe of detail. I think the thrust here was to go end to end on a free form bowl and to use a beautiful piece of wood that otherwise I had no way to use unless perhaps I was making a wooden turtle – which did occur to me, really.